The South Campus Rail Trail is an old gravel railroad bed located just south of Highway 6 and just west of Chucky Mullins Drive. Click here for a Google map link. This trail was formerly (and colloquially) known as the “Whirlpool Trails” because of an old appliance factory that resided nearby (which is now being renovated into the South Campus Recreation Center). The marked rail bed trail is five miles, out and back. The University’s goal in managing this property is to provide a quality recreational experience for students, faculty, staff, and Oxford and Lafayette County community members who walk, run, and bike on the trail. It is the intent of the University to provide minimal signage on this trail in an effort to convey the appropriate usage policies and mileage while respecting the City of Oxford’s recreational easement. The Department of Campus Recreation is the primary point of contact for internal and external inquiries regarding the South Campus Rail Trail, and is responsible for oversight of programming and events on this trail. If you have any questions about the trail equipment, special events, or logistics, please contact Campus Recreation. Campus Recreation is not the primary contact for search and rescue, medical response, or other personal safety concerns. If there is a safety concern, please contact the University Police Department at 662-915-7234. The property and trail marked on the map are to be used for outdoor recreational purposes only. Approved recreational activities include walking, jogging, and bicycling. To help preserve the natural habitat of the South Campus Rail Trail, the following activities are prohibited: hunting, fishing, camping, littering, disturbing wildlife, harming plants, ATVs, unauthorized vehicles, horseback riding, and collecting or digging for artifacts. Dogs must be leashed on the South Campus Rail Trail; please pick up after your dog. Please be respectful to other visitors and help preserve the natural habitat of the South Campus Rail Trail and surrounding areas. Safety cannot be guaranteed and hazards are inevitable elements in a natural environment. All visitors entering this property enter at their own risk, assume the risk of injury and are responsible for their own safety. The University of Mississippi does not maintain the single track bike trail network and is not responsible to visitors for any injury or property damage occurring on the South Campus Rail Trail or any other portion of property adjacent to the South Campus Rail Trail. Recommendations for a safe recreation experience include carrying a cell phone (service is not guaranteed however), stay with a friend or group, do not trespass on surrounding property, and be a good neighbor and watch out for others. 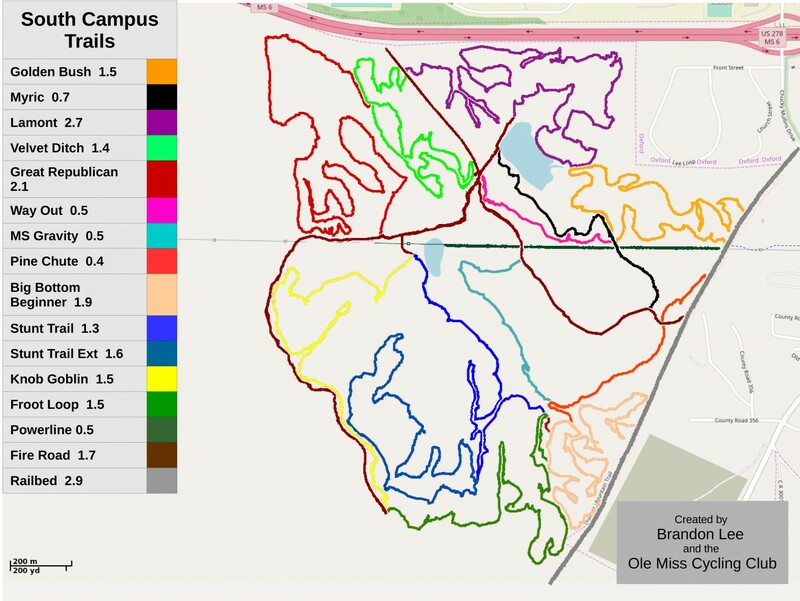 The single track bike trails are maintained on a volunteer basis by local organizations, including the Ole Miss Cycling Club (map credit) and Oxford Cycling. Here is a link to a Google map of the single track trails. For more information on getting involved with trail maintenance, please contact these two organizations. If you have a question about recreating or hosting a recreational event on the South Campus Rail Trail, please email campusrec@olemiss.edu. If you would like to host an event at the trail, click here to complete the special event registration form. Informational signs and mile markers are located at the trail (mile markers are every .5 mile) and are located on the right side of the trail facing the direction you are running). Please note that the mile markers were placed using a measuring wheel, so if you’re using a GPS app, please note that the distance on your device may be slightly off due to the approximate nature of satellite positioning. If you would like to bike the trail, Ole Miss Outdoors offers Fuji mountain bike rentals (click here). Campus Recreation is not responsible for trash pickup or maintenance of trail (clearing brush, clearing limbs/felled trees, repairing bridges, washouts, etc.). The local bike club will still maintain the single track bike trails that connect to the main rail-bed trail. In the spring of 2017, a grant from Blue Cross Blue Shield of Mississippi Foundation provided two fitness stations along the trail, located at mile markers zero and 1.5. Please watch the video below for an overview of this equipment. Exercises that can be completed on this equipment include pull-ups, dips, inverse rows, knee tucks, box jumps, step-ups, and more. Click here to view a video showcasing the South Campus Rail Trail. Click here to view the fit trail stations at the South Campus Rail Trail.